Non-commercial group the Gunong Sayang Association is staging a rather compelling project at the end of October. The cultural society and theatre troupe, whose name translates from Bahasa Melayu and Peranakan Creole to “Mountain Of Love”, will put on a play entitled Udang Sebalek Batu with volunteer artistes who will include cross-dressers – mainly Peranakans who participate for free. The production’s talents include Matthew Chen, who is noted for his flair with female impersonations, and has commented that he enjoys being brought back to the time when speaking Peranakan patois was commonplace. 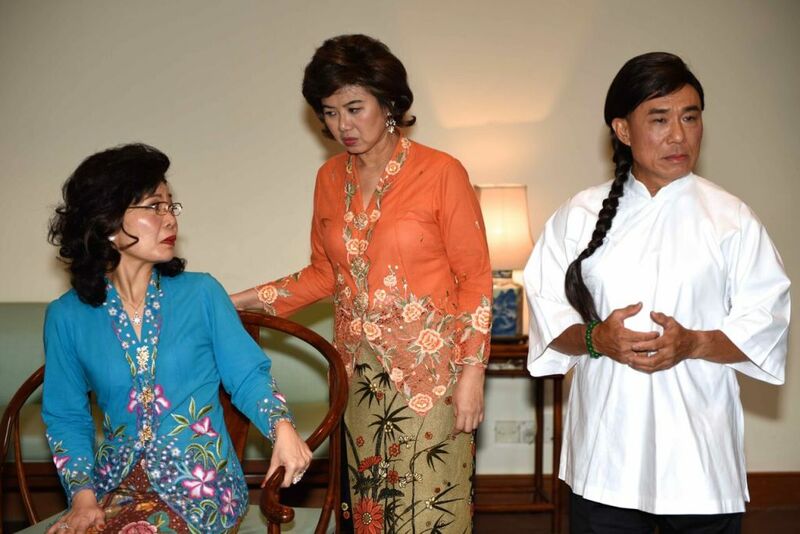 He is joined by comedian Lee Yong Meng who will reprise his popular maid character in the Udang Sebalek Batu household, as well as Kelvin Tan, who has portrayed feminine characters in plays for Malaysian nobility. The culture of thespians cross-dressing in Peranakan plays originate from days when women could not shamelessly take to the stage. The Gunong Sayang Association is unlike the Peranakan Association, which does not stage plays, and is different from the Main Wayang (“engaging in theatrical performance”) Company, which is commercially run. Established in 1910, Gunong Sayang has been staging Peranakan-themed plays since 1986 and its patron is Professor Walter Woon, Singapore’s former Attorney General. Through the labours of an impassioned and knowledgeable team, Gunong Sayang presents a stellar archetype of their heritage, enriched with elaborate and authentic costumes, accessories and backdrops. The play will be in performed in Peranakan Patois, the cherished tongue of the Straits Chinese, but will be bolstered by subtitles for the benefit of its non-Peranakan-speaking audience. Each and every dance recital, musical performance and theatre production by the Gunong Sayang Association has fervently promoted the traditions of the Straits Chinese. 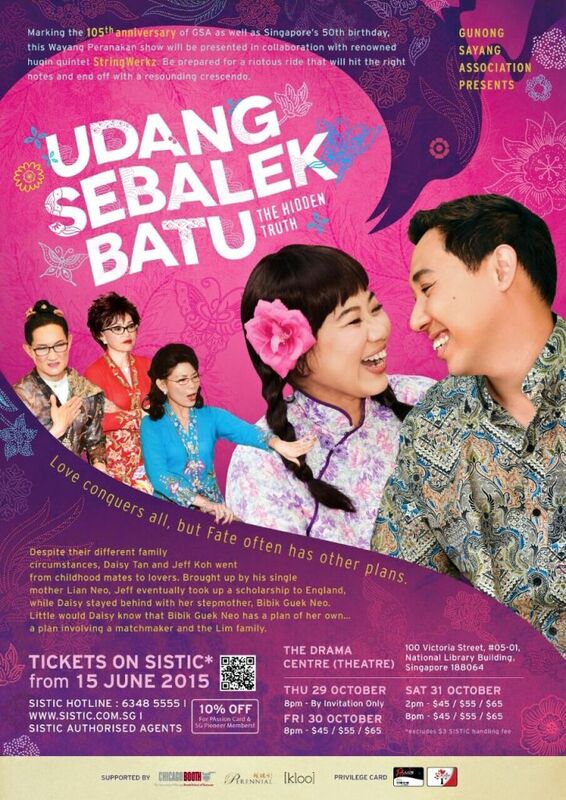 A light-hearted comedy about the drama revolving around a young couple’s love story, Udang Sebalek Batu translates to “The Prawn Behind The Rock”, which is a Malay proverb for uncovering a hidden truth – a metaphor for this colourful and lively exposition of a culture that is lesser known to some, and heartily celebrated by the initiated. Udang Sebalek Batu will be put on at the Drama Centre Theatre at the National Library Building on Friday 30th October 2015 at 8pm and on Saturday 31st October at 2pm and 8pm. Ticket prices and discount details are available at sistic.com.